Mariners Latest: Felix Gets Run Support As M's Stomp Tigers! 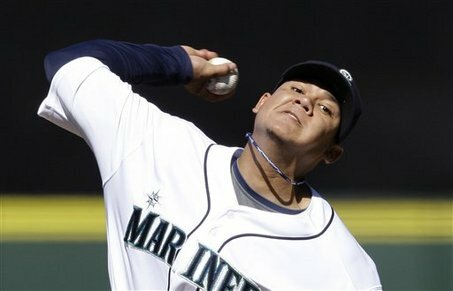 Felix Gets Run Support As M's Stomp Tigers! Oh what a feeling! A great feeling for Felix Hernandez as the Mariners jumped on Detroit Tigers starter in the first inning for a run and didn't relent in the second or the third. Adam Wilk never found a rhythm as he ended up getting pulled before there were any outs in the third and the M's had a 6 run lead. The Mariners first run came in the 1st inning after Dustin Ackley and Ichiro Suzuki singled. With two outs, Jesus Montero hit a line drive to right field, scoring Ackley and putting the M's on the board. The second inning, the Mariners had the bases loaded before there were any outs. Ackley came to the plate and singled in Miguel Olivo and Michael Saunders who both singled to start the inning. Casper Wells moved to third and Ackley to second on the throw home. Wells got aboard via a walk. Still nobody out, Brendan Ryan hit a sac fly that scored Wells and made the score 4 - 0. Then there was the 3rd inning. It started with a Jesus Montero single to third base. Then came Alex Liddi. For the second night in a row he hit a shot over the left field wall over the Detroit bullpen. Tonight Liddi was in the lineup for Kyle Seager and played third. Something tells me that he wants to stay in the MLB. That was all for Wilk, Jim Leyland changed pitchers and that settled things down for a moment. Felix struggled in the first, loading the bases via walks and finally getting out of the inning on an Alex Avila ground ball. He threw 28 pitches, only 10 of them for strikes. To lead off the third inning, Felix was taken deep by Brennan Boesch to make the score 6 - 1 and that would be the only run that Hernandez gave up. 7 innings, just 4 hits, 3 walks and only 2 strikeouts. Not a typical night for Felix, but still dominant. The Mariners continued on offense, getting another run on a Dustin Ackley double in the fifth that scored Casper Wells and they got 2 in the 6th on a Montero single that scored Ichiro and a Michael Saunders bases loaded walk. They spread out 15 hits in the game, 9 runs, 3 doubles and a homer. They also managed 4 walks and only struck out 5 times. There were still a couple of areas where we made some bad outs, but all in all, it's the second night in a row that we have pulled out 15 hits and I'm hoping and praying that this offense will continue. Every single Mariner in the lineup got on base. Every Mariner got a hit with the exception of Justin Smoak and Brendan Ryan who both got on base via a walk. Smaok scored a run, leaving just Brendan Ryan to be the lone Mariner not to score. Ichiro, Ackley, Montero, Liddi and Saunders all had multiple hits and will hopefully be in the lineup for tomorrow's game as well. A terrific game, against a terrific team in which we have the opportunity of pulling off a terrific sweep tomorrow. Let's hope that this series versus Detroit is a turning point in the season and that as a team, we don't ever look back!